The following was written by Rosalynde Welch for the St. Louis Post-Dispatch. The event referred to took place the weekend September 23, 2017. For two Mormon missionaries, last Saturday was a long day of sharing their gospel message in the hot streets of St. Louis. But the pair of missionaries was not knocking doors. They were tagging a public wall with spray paint. Their graffiti? An 11-foot, four-layer image of Jesus, emblazoned with the web address MORMON.ORG. Elder Jacob Burgoyne, 19, the lead artist, had worked toward this moment for nearly a year. One day last fall, he stumbled on photos of the international street art festival Paint Louis, held annually at the flood wall south of the Gateway Arch. Burgoyne knew he wanted to be part of it in 2017. He prepared a portfolio of his artwork and submitted it to festival organizers. Once he got notice of acceptance, he had to sell the idea to his mission president, the church official who supervises the missionary force in eastern Missouri and southern Illinois. After that, it was just a matter of finding time in their proselytizing schedule to prepare the complex stencils out of taped-together cardstock. Burgoyne enlisted the help of his companions to hold the stencils steady for hours as he painstakingly cut out the design with X-acto knives. They went through dozens of blades. The design he produced is imposing and spare. 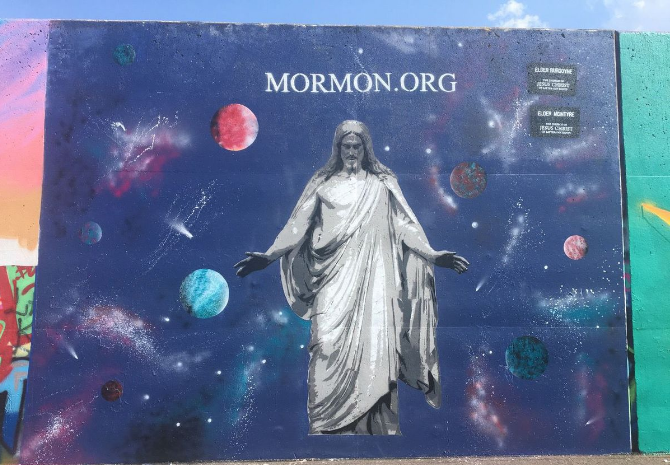 An 11-foot Christ dominates the wall against a background of colorful galaxies, a reference to Christ’s creation of the cosmos in Mormon teaching. In a clever nod, Burgoyne’s and McIntyre’s traditional black missionary name tags appear as the graffiti “tag” of the artists. Burgoyne has a simple message to communicate with this mural: Mormons worship Christ. To read the full article on the St. Louis Post-Dispatch, click here.